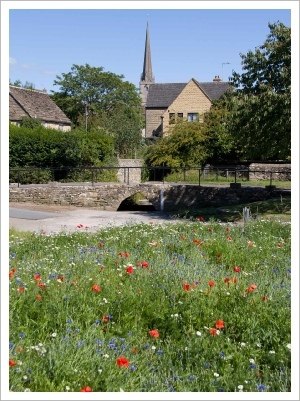 Tetbury in Bloom has grown to become an integral part of the town, with lots of community support. We are often asked by groups from other towns how they can follow our example. start small, take on new projects as you go, don’t try to do it all at once, make it fun, build on success. Below is a very brief history of the new projects we have completed from our beginnings in 2005, from adopting and creating flower beds to tidying up areas of the town that needed it. You can find more details about each project under the “What we do” button on the menu on the left. Early on we decided to change all the beds in town from the traditional carpet bedding style to sustainable planting using perennials wherever possible to give structure and colour throughout the year, supplemented by spring bulbs and relatively small numbers of annuals to add a splash of colour where needed. This was a huge undertaking for a small team, but we did it, starting with just two beds to prove the concept and then gradually converting all the other beds, each with its own character. Click on the captions to read more about them and see the ‘before and after’ photos. For us, it's not just about plants, nor is it just about entering a competition; we enjoy making a positive difference to where we live - for the benefit of everyone. 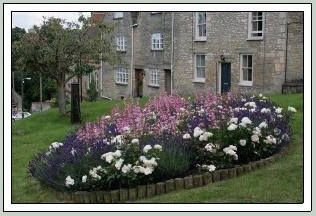 The first 2 beds to receive a Tetbury in Bloom makeover were The Knapp and Braybrooke Close. 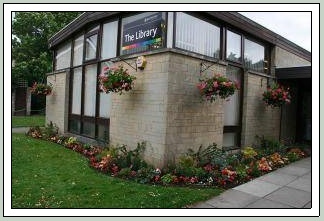 This was our first trial of sustainable planting in public flowerbeds, so was something of an experiment. Even in their first season these beds looked better, had longer lasting displays and needed less ongoing maintenance once planted than any of the traditional bedding displays. 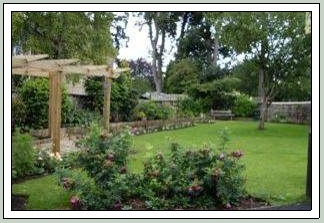 We had proven that sustainable planting designed to suit the character and conditions of each site could be a success. 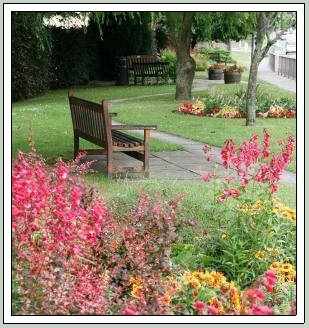 2006 was a very busy year - we were keen to adopt sustainable planting schemes for as many of the town’s flowerbeds as we could and gradually we transformed much of the town (or at least the green spaces and floral displays!). The Hospital bed received its makeover in April followed by The Princess Diana Memorial Flowerbed in May and the London Road beds in June. The largest individual project in 2006 was the creation of a huge star-shaped bed on the Roundabout on London Road (towards Cirencester) in late June. This was followed in July by the Fire Station bed which was funded by a generous donation from the Fire and Rescue Service themselves and the planting of the trees in Old Brewery Lane car park (with some help from HRH the Prince of Wales and the Duchess of Cornwall). 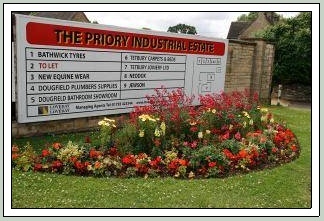 In 2007, the Civic Society funded the rejuvenation of The Anniversary Garden and a new bed was created at the entrance to the Priory Industrial Estate in London Road. 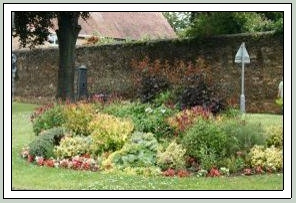 The beds outside the West Street toilets were also given a makeover and made into a cottage style garden. This transformation resulted in us winning the British Toilet Association Award for ‘Best Dressed Public Toilet’ two years running 2007 & 2008. The transformation of the town’s flowerbeds had improved the look of the town, particularly in summer, so we decided that our next project should be to add spring planting to the new beds, and elsewhere, to extend the season. 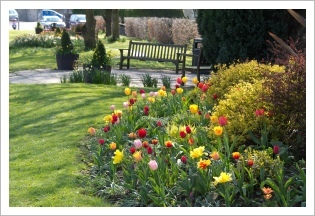 In the autumn of 2007 we planted over 9000 spring bulbs throughout the town , mostly daffodils and tulips all chosen specially to suit the conditions or complement the look of existing planting, and these produced the most wonderful Spring display Tetbury had ever seen. We also adopted the frontage of Old Coombe House, New Church Street and created a new bed at the Public Library in Close Gardens. 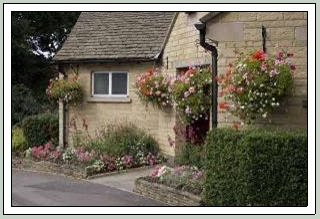 2009 was Tetbury’s first year in the national Britain in Bloom competition, having been nominated to represent the Heart of England after winning another Gold award in 2008. 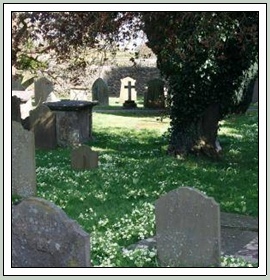 For 2009 our main project was adoption of St Marys’ Churchyard, replanting existing flowerbeds and creating new ones, introducing wildflowers, tidying overgrown areas and creating new compost heaps. We also planted wildflowers on the grass bank at the rear of the West Street car park. Over the winter we did some significant maintenance work in the existing beds, moving overgrown shrubs to better locations and splitting perennials and transplanting them to other beds. Like any living, growing, garden our sustainable planting schemes need periodic attention to keep them at their best. We also decided to do something to improve the appearance of a vacant industrial site near the edge of the town on the road to Cirencester. 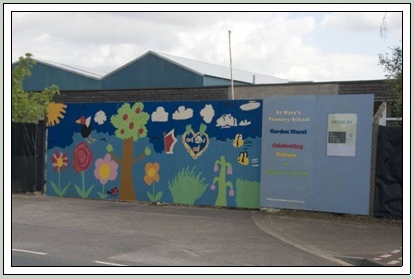 With the agreement of the site owners (Builders Ede) we decided to cheer up the site with a mural and ran a competition at St Mary’s Primary School to find a colourful and uplifting design. The image below shows the finished mural in place, painted by pupils from Leomi Potter’s winning design. When Tetbury in Bloom do “painting by numbers”, we do it big and bright and make sure we all have fun doing it! Built in 1959, The Dolphins Hall is Tetbury’s community hall. The grounds in which it is located are mainly laid to lawn and the building itself is flanked by narrow flower beds on 3 sides. Over the years these had been filled with various shrubs and perennials, most of which which had gradually out grown their position. 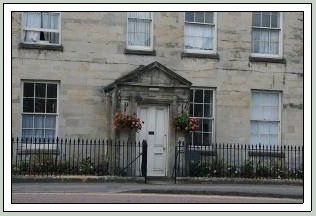 Although Tetbury in Bloom had never taken on the responsibility for the gardens, we had always given cursory attention to the two front beds that can be seen from the road. These were filled with large fuchsias and roses. Either side of the front doors were 2 large euonymus bushes that had well outgrown their position and having been drastically chopped back several times over the years they had had become tired and were struggling so it was clear that they had outlived their time there. 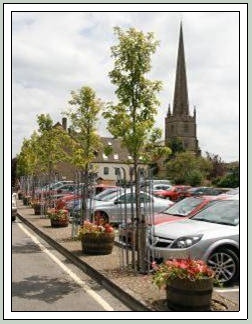 So in 2010 (with permission) Tetbury in Bloom took on the challenge of digging them out and replacing them with two four foot high box cones. 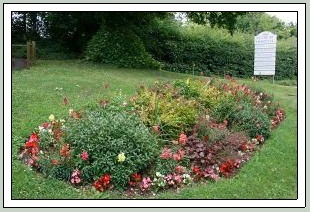 For the summer the remaining space in the brick planters was filled with bedding geraniums. The result was such an improvement we decided that we should really tackle the side bed too. Many people walk or drive past this bed on their way to the car park or to the Recreation ground both of which are situated at the rear of the Dolphins Hall and it needed attention. A project for 2011. 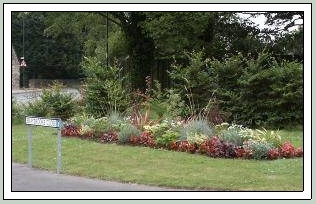 In 2011 the Dolphins Hall side bed was cleared of all of the old shrubs and in their place we planted several Box bushes that we transplanted from a ‘nursery bed’ up at the roundabout. Hardy fuchsias, heuchera & euonymus were also planted to create a colourful, low maintenance bed that looks good all year round. 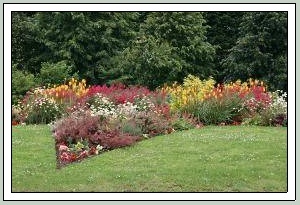 We were in the Britain in Bloom National Finals again in 2011 and decided to create a wild flower meadow. We chose a semi rural location down by the ford in Cutwell, which we were allowed to take over by kind permission of the Feoffees of Tetbury. We sought expert advice from The National Wildflower Centre in Liverpool and also invited retired Heart of England judge, David Wassell MBE, to come and give us hands-on advice on what to do to achieve the best results. Armed with our newly acquired knowledge we set to and the first step was to get rid of the existing grass. The second step was to rake over the soil to a fine tilth, sow the seed (Pictorial Meadows Native Cornfield Annual Mix) which included pretty native annuals of Field Poppy, Cornflower, Corn Marigold, Scentless Mayweed & Corncockle and then wait 10 to 14 weeks. The results were spectacular - far better than we ever imagined they would be so we tried the same again in 2012, though the “difficult” weather that year, including flooding of part of the area made it much more difficult for the wildflowers. 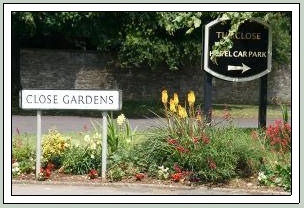 2012 was an unusual year for Tetbury in Bloom. We decided to take a break from competition and to concentrate instead on doing what we do best: looking after the town. We had a year without judges; no last minute sweeping and tidying, freedom to try out new ideas without worrying that they might not work and time to step back, relax (a little) and enjoy the results of all the hard work. From that year on we haven’t competed again, preferring now to do it all for pleasure. We still follow the RHS philosophy of making the town look cared for and a place where people will be proud to live, work and visit. The team (including some new members and some older ones now having retired) is out just as often - 2 mornings every week throughout the year, though it is nicer to have ourselves, visitors and our fellow residents of Tetbury as our judges.